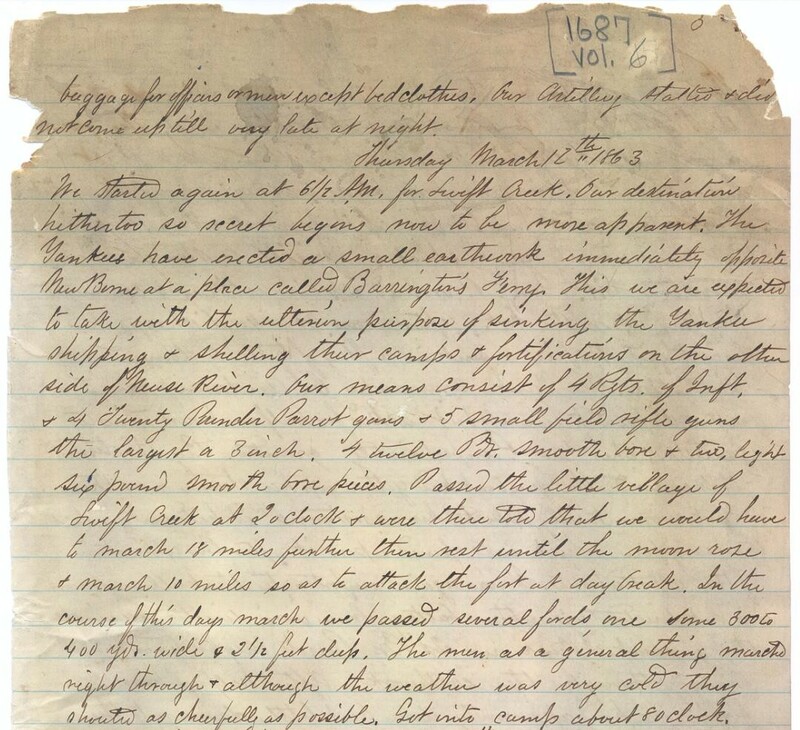 Item description: Entry, dated 12 March 1863, from the diary of Henry King Burgwyn, Jr.
Henry King “Harry” Burgwyn, Jr. (1841-1863), known as “The Boy Colonel,” was the oldest son of Henry King Burgwyn and his wife, the former Anna Greenough (1817-1887). He was one of the youngest colonels in the Civil War. He studied at West Point from 1856 to 1857, graduated from the University of North Carolina in 1857, and from Virginia Military Institute, Lexington, Va., in 1861. At age nineteen he was elected lieutenant colonel of the Twenty-sixth North Carolina Regiment of the Confederate Army. This regiment, whose colonel was Zebulon B. Vance, was involved in battles in coastal and eastern North Carolina and in the Petersburg-Richmond area of Virginia. When Vance resigned to become governor of North Carolina in the late summer of 1862, Burgwyn was promoted to colonel. He was killed in the Battle of Gettysburg, 1 July 1863. Item citation: From Volume-1687/6, Diary of Henry K. Burgwyn, 12 March 1863-12 June 1863, in the Burgwyn Family Papers #1687, Southern Historical Collection, Wilson Library, University of North Carolina at Chapel Hill. We started again at 6 1/2 AM, for Swift Creek. Our destination hithertoo so secret begins now to be more apparent. The Yankees have erected a small earthwork immediately opposite New Berne at a place called Barrington’s Ferry. This we are expected to take with the ulterior purpose of sinking the Yankee shipping & shelling their camps & fortifications on the other side of Neuse River. Our means consist of 4 Rgts. of Inft. & 4 Twenty Pounder Parrot guns & 5 small field rifle guns, the largest a 3 inch, 4 twelve Pdr. smooth bore & two, light six pound smooth bore pieces. Passed the little village of Swift Creek at 2 o’clock & were there told that we would have to march 18 miles further then rest until the moon rose & march 10 miles so as to attack the fort at day break. In the course of this days march we passed several fords, one some 300 to 400 yds. wide & 2 1/2 feet deep. The men as a general thing marched right through & although the weather was very cold they shouted as cheerfully as possible. Got into camp about 8 o’clock. 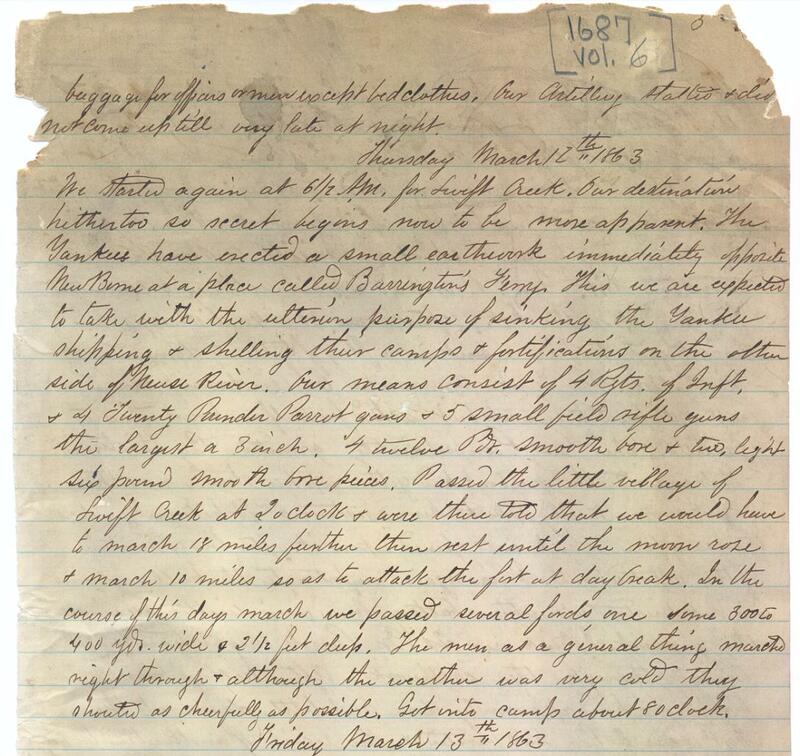 This entry was posted in Southern Historical Collection and tagged 26th North Carolina Infantry Regiment, artillery, Barrington's Ferry, Burgwyn family, cannons, diaries, Henry King Burgwyn Jr., Neuse River, New Bern, North Carolina, Swift Creek. Bookmark the permalink.